The play "Tamamo-no-Mae Asahi no Tamoto" was originally written for the puppet theater (Bunraku) and staged for the first time in the 1st lunar month of 1751 in Ôsaka at the Toyotakeza. 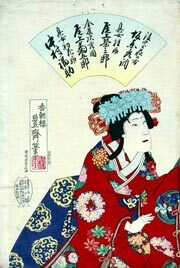 It was adapted for Kabuki in the following days and staged for the first time in Kyôto in the 1st lunar month of 1751 at Miyako Handayû 's theater [more details]. 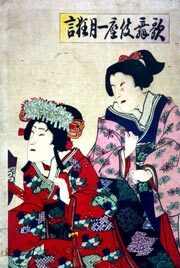 The play was revived and revised for the puppet theater in 1806 by Chikamatsu Baishiken and Sagawa Tôta. This revision was staged in a minor puppet theater in the 3rd lunar month of 1806 in Ôsaka. This revision was adapted for Kabuki several years later, in the 7th lunar month of 1811 at the Ichimuraza [more details]. "Tamamo-no-Mae Asahi no Tamoto" was a 5-act drama. The most important scene, which is still part of the current Kabuki repertoire, is "Michiharu Yakata", the final scene (kiri) of the third act. The nickname of this scene is "Tamasan", with tama being the first ideogram of Tamamo-no-Mae and san meaning third (act). The first scene of the 3rd act, "Kiyomizudera", was revived at the National Theatre in December 1980. On his visit to Kiyomizu Temple in Kyôto, Prince Usugumo, elder brother of Emperor Toba, tells Inubuchi, one of his retainers, that he is planning to become Emperor by dethroning his brother. After the prince and his party have gone to visit the chief abbot in his chamber, Katsura, daughter of Michiharu, the late Minister of the Right, arrives with her maids and happens to meet Unemenosuke, younger brother of Yasunari, chief of the astrological office. Katsura, who loves Unemenosuke, takes advantage of this chance encounter to ask him to marry her. Before she can get his consent Inubuchi intrudes to demand that Katsura accept Prince Usugumo's love. He is, however, repelled by Unemenosuke, who helps Katsura escape. When Hatsuhana, Katsura's younger sister, is playing the koto in a room Katsura rushes in and embraces her, apparently mistaking her for Unemenosuke in a daydream. Soon noticing her mistake, Katsura feels ashamed. Hatsuhana tenderly advises her to take care not to let her love sickness spoil her health. At this moment Unemenosuke visits the house, having been called by the sisters' mother, Hagi-no-Kata. When left alone with Katsura before meeting Hagi-no-Kata, Unemenosuke tells Katsura to give him up and comply with Prince Usugumo's persistent request for her hand. Katsura protests but reluctantly leaves him as the sound of her mother's approach is heard. Hagi-no-Kata asks Unemenosuke to recover for her the precious sword named Shishio, which has been stolen from her house. 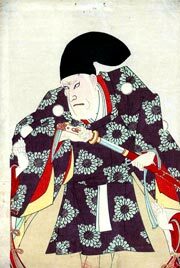 Unemenosuke promises to do his best and, when informed of the visit of a messenger from Prince Usugumo, enters an inner room. The messenger, whose name is Washizuka Kintôji Hidekuni, arrogantly tells Hagi-no-Kata to present the sword Shishio or Katsura's severed head to Prince Usugumo. In the absence of the sword the only way to comply with the prince's demand is to behead Katsura. But Hagi-no-Kata desperately appeals to Kintôji not to kill Katsura because she is not her real offspring but an adopted daughter. She explains that she found Katsura as an infant abandoned in the compound of a Shintô shrine near the Kiyomizu Temple. As she cannot agree to sacrifice Katsura, whom she considers to be a godsend, she proposes to offer Hatsuhana, her real daughter, as her substitute. Kintôji at first refuses but then agrees to a compromise plan proposed by Hagi-no-Kata to sacrifice either Katsura or Hatsuhana, choosing the scapegoat by a game of backgammon. Hatsuhana, who is kind-hearted, deliberately loses the game so that Katsura's life may be saved. But Kintôji beheads Katsura, not Hatsuhana. Angry at his breach of promise, Hagi-no-Kata attacks him with a halberd. Unemenosuke rushes out of the inner room to help her and fatally slashes Kintôji with a sword. Before he breathes his last, Kintôji reveals that he is in fact Katsura's father and that he has stolen the Shishio sword by Prince Usugumo's order.